SHANGHAI -- Hybrid cars haven't been a big hit in China. Shanghai rolled out 350 Buick LaCrosse Hybrids for use as taxis for the green-themed World Expo in 2010, but the cars disappeared soon after the exhibition ended. Toyota infamously sold only one of its world-leading Prius models in China during the same year. Sales of the utilitarian Prius have rebounded slightly but are still slow. Imported Honda gasoline-electric cars, meanwhile, have been faring worse. Hybrids, however, are making inroads at the premium end of China's car market. 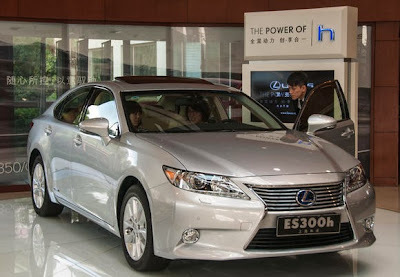 Toyota's luxury Lexus division is on track to sell close to 20,000 hybrids in China in 2013. Last year, it unloaded 16,000 of the things, leaving Prius sales way behind at 2,434. Lexus last month pointedly unveiled the revamped CT200h model at the Guangzhou Auto Show rather than at shows going on at the same time in Tokyo and Los Angeles. Mercedes is also finding a welcome for its hybrid S-class sedans, though it isn't giving out figures. "It is easy to sell these cars," a sales manager at a Shanghai Lexus dealership said, gesturing at the CT200h hybrid and other models. "We firstly emphasize the six-year warranty and secondly that it saves fuel." Indeed, fuel economy has not been a strong selling point in China, where most car buyers are first-time purchasers. Said Boni Sa, an automotive analyst at consultancy IHS Automotive: "For these first-time buyers, they have more to consider, like brand, vehicle size, features or safety. In an emerging market like China, to spend money on a better brand or larger model is much more reasonable than spending money on better fuel consumption." Price is a key factor even for repeat buyers. In Chengdu, where the Prius is produced, businessman Jimi He recently bought his third car, a Volkswagen Tiguan crossover. "I'd love a hybrid," He said. "It is more environment-friendly and more energy-saving. However, the price is the key issue that stops me from getting one." The argument that buyers will recoup the higher upfront cost of a hybrid through fuel savings is not so convincing in China. To recover the 12,000 yuan ($1,976) price premium on the hybrid version of SAIC Motor's locally developed Roewe 750 sedan, for example, would require driving the car at least 100,000 kilometers. Some automakers had campaigned for Beijing to begin subsidizing gas-electric hybrid purchases this year. They argued this could be more effective in addressing pollution concerns than the government's generous subsidies for pure electric cars and plug-in hybrids, which have not generated significant sales. Instead, China in September renewed the existing subsidies. So the carmakers are finding other ways to close the price gap. Toyota announced at the Guangzhou show that it will localize production of batteries and hybrid motors for the Prius and Camry Hybrid. These components are now imported and slapped with high duties. As it stands, for the price of a Prius, a Chinese buyer can get a much larger family car. This is why hybrids are attracting buyers for whom price is less of an issue. "Some customers are buying a Lexus SUV or a Mercedes-Benz S-class rather than hybrid vehicles," Sa said. "Hybrids' inflated costs can be ignored by these customers." At the premium end, hybrids can be positioned as high-tech and top-of-the-range rather than fuel-saving and environmentally friendly. A new Mercedes E400 hybrid is to offer a more powerful engine with better acceleration than that of the standard model. "Premium carmakers have a higher chance of success in the area of hybrid vehicles, mainly because premium autos are not purchased by price-sensitive consumers" said Bill Russo, president and chief executive of automotive consultancy Synergistics in Beijing. "It is still a small market but will grow as more automakers slowly introduce more models." The long wheel-base E-class Mercedes will be the first premium hybrid to be produced in China. Infiniti is set to begin producing cars in China 2014, and Lexus is a possibility. After an uncharacteristic deceleration in 2012, the world’s largest car market is again growing at a double-digit clip, writes Tom Mitchell in Beijing. LMC Automotive, a consultancy, estimates that sales of passenger vehicles in China from January to September increased 15 per cent to almost 12m units. That compares with expected growth of less than 8 per cent in the US for 2013, and projected year-on-year declines in Brazil, Russia, India, Germany and Japan. China’s four richest urban centres seem to be overwhelmed with traffic congestion and related pollution issues. But Beijing, Shanghai, Guangzhou and Shenzhen are just at the point where car ownership traditionally begins to take off – when per capita GDP reaches $10,000. According to Synergistics, another automotive consultancy, that figure in China’s “big four” regional car markets now stands at more than $12,700. Moreover, manufacturers are turning their attention to the smaller cities where more than 80 per cent of the country’s 1.3bn people live and per capita gross domestic product is about $4,000. In volume terms, GM is the second most successful multinational car company operating in China. Its joint ventures with SAIC, First Auto Works and Wuling sold 1.1m passenger vehicles over the first three quarters of this year, compared with Volkswagen’s 1.9m. Analysts attribute GM’s and VW’s success in China to aggressive localisation of production, research and development – a tactic that automakers at the luxury end of the spectrum are also adopting. Daimler formally opened an engine plant in Beijing in November – its first outside Germany – that will eventually export components to Europe. Yet China has yet to emerge as a significant automotive exporter as Japan and Korea did before it, especially to the US and Europe. Over the first eight months of this year, China’s vehicle exports fell three per cent over the same period in 2012 to just 500,000 units. People wearing masks walk along The Bund in Shanghai on Dec. 8, 2013. Bill Russo moved more than 700 miles from Beijing to Shanghai on Dec. 1 and thought he’d left the smog behind him. Five days later, he was wheezing again. “What was shocking was how bad it’s been,” said Russo, a vice president at car stereo maker Harman International Industries Inc. “Shanghai over the years had a reputation of being better,” said the executive, who had some of the fine-particle masks he left behind in Beijing sent to him. Record levels of pollution this month busted perceptions of Shanghai as a place to escape the smog that’s shrouded Beijing and other parts of China. Worsening air quality in the country’s commercial hub prompted warnings to keep children indoors, spurred companies from Unilever to Uniqlo owner Fast Retailing Co. to give workers face masks, and may hinder Shanghai’s push to be a global financial center by 2020. “I felt like I had dust in my mouth and throat all the time,” said Thomas Walser, a manager at a relocation company who moved to Shanghai from Austria in 2009. After Shanghai ordered vehicles off the road and factories to cut production, Baosteel Group Corp. said it will limit processing of sinter, the iron ore nodules used to make steel. The company that controls China’s largest listed steelmaker also suspended outdoor operations of its chemical facilities. People wander at the Bund as heavy smog engulfs Shanghai on Nov. 7, 2013. To help address chronic flight delays, China ordered commercial pilots to learn to “land blind” in smoggy conditions. Starting next year, pilots flying to Beijing from the nation’s 10 busiest airports must be qualified to land when visibility falls below 400 meters (1,300 feet), the official China Daily said on Dec. 12, citing unidentified people at the Civil Aviation Administration of China. Spring Airlines Co., China’s biggest carrier outside government control, said it’s training pilots to land in smog. Shanghai’s pollution earlier this month affected operations, the carrier said, declining to be more specific. Pilots in China need to be qualified to be able to land when visibility falls to 800 meters with runway visual range of 550 meters, said Spring Airlines Senior Vice President Shen Wei. Shanghai’s air pollution index surged to a record 482 on Dec. 6, the worst since monitoring began last year. The air quality index monitored by the U.S. consulate surged past 500 to the “beyond index” level. For at least seven of the first 10 days of the month, the air was considered too toxic to allow children and the elderly outdoors. Levels of PM2.5 -- particles smaller than 2.5 microns in diameter that pose the biggest health risk -- were 602.2 micrograms per cubic meter, or about 24 times the World Health Organization’s recommended limit. A satellite image dated Dec. 7 on the NASA Earth Observatory website showed haze stretching from Beijing to Shanghai. By Dec. 10, Shanghai’s government said air quality improved to “lightly polluted.” The pollution warning was removed yesterday Dec16 with PM2.5 levels dropping below the World Health Organization’s recommended 25 micrograms per cubic meter deemed to be safe for 24-hour exposure. Unilever, the world’s second-largest consumer-goods maker, has distributed face N95 rated masks, which filter at least 95 percent of particles, to employees in Shanghai. On Dec. 6 it told most staff to work from home the following Monday, and a manager’s meeting scheduled for Dec. 10 was canceled. Fast Retailing, operator of Uniqlo clothing shops, handed out masks to employees in Shanghai, the company said in a statement. Because of the smog, InterContinental Hotels Group Plc’s 30 hotels in Shanghai will be cleaning their air conditioning systems more frequently, similar to what they do in Beijing, it said in a statement. In some hotels, staff will rotate air purifiers through the rooms. In Beijing, air quality was worse than government standards on more than 60 percent of days in the first half, the Ministry of Environmental Protection said in July. Shanghai’s was below government standards on less than 35 percent of the days and had no days rated as “heavily polluted,” it said. The PM2.5 annual standard for cities is 35 micrograms, the report said. The capital in January suffered its worst bout of air pollution with PM2.5 readings averaging 194 micrograms per cubic meter per day, with an intraday peak of 886 on Jan. 12. Exposure to PM2.5 contributed to 8,572 premature deaths in Beijing, Shanghai, Guangzhou and Xi’an in 2012, and led to economic losses of $1.08 billion, according to estimates by Greenpeace and Peking University’s School of Public Health. China has 16 of the 20 most-polluted cities globally, according to World Bank estimates. Pollution has become the top cause of social unrest in China, Chen Jiping, a former leading member of the Communist Party’s Committee of Political and Legislative Affairs, said in March. While the worsening pollution alone won’t stop companies from moving people to China, it has “a big impact” on executives with children, said Steve Mullinjer, regional leader for Asia and the Middle East at executive-search firm Heidrick & Struggles International Inc. The dirtier air “is restricting the type of people they can get or transfer or hire,” he said by phone from Shanghai. The “living environment” is the top human-resources challenge facing European companies trying to retain talent in China, said Ioana Kraft, Shanghai-based general manager for the European Union Chamber of Commerce. Sales of air purifiers on Alibaba Group Holding Ltd.’s Tmall site surged to as much as six times the daily average in the first week of this month. 3M Co., which donated face masks to kindergartens in Beijing as well as to traffic policemen in Shanghai, plans to increase production in China after stock sold out on Dec. 6 and 9, said Royce Hua, the company’s corporate communications chief in the country. That might take about three months to achieve, he said, declining to be provide more details. Honeywell International Inc., whose products range from aviation controls and auto turbochargers to solvents and medical devices, said respirator masks were sold out on its Tmall online store from Dec. 6 to 9. Sales of building air filtration solutions and air purifiers made by the Morris Township, New Jersey-based company have grown more than 50 percent annually over the past several years, said Lydia Lu, a vice-president for communications. Honeywell has given masks to its staff and a local union is arranging for local employees’ to purchase air purifiers at a discount. PSA Peugeot Citroën and China’s state-owned carmaker Dongfeng Motor have agreed the main terms of an industrial and commercial partnership that will include a large capital injection into the French group in return for technology sharing. The two carmakers are still hammering out the details but the agreement is expected to involve a €3bn-€4bn capital raising by Peugeot and an agreement for the two groups jointly to develop and produce low-cost small cars for southeast Asian markets. Peugeot hopes to be able to have the deal announced in the first quarter of next year, according to two people briefed on the discussions. The French group is desperate to lower its over-dependence on the moribund European car market and is rapidly burning through its capital reserves. Both Peugeot and Dongfeng declined to comment. Peugeot closed down the first large car factory in France for 30 years this year and reduced its workforce as it seeks to reduce the €3bn cash burn it suffered in the full year 2012. It recently hired a former Renault executive to lead a more globalised push. The company already has a successful joint venture with Dongfeng building cars in China, but trails rivals such as Fiat and Volkswagen in markets such as South America, and Renault-Nissan in tapping growth in southeast Asian markets. Carmakers have increasingly turned to alliances and joint ventures to increase their scale and cost efficiencies, but a deal between Peugeot and General Motors to share some products and suppliers has failed to live up to the French carmaker’s hopes. There are expected to be 5.5m cars and light vehicles sold in southeast Asia this year, roughly half the size of western Europe. But the region’s market is expected to grow by more than half by the end of the decade, versus flat or marginal growth in Europe. Negotiations are continuing between Dongfeng and Peugeot about exactly how much the Chinese group will pay for what percentage of Peugeot. The people briefed on the discussions, who declined to be named as the talks were private, added that it could still all fall apart, although this was looking less and less likely. The French state is contemplating matching any investment made by the Chinese group to maintain French influence over the company. The most likely investment by Dongfeng and the French state would give the Chinese carmaker and Paris 17.6 per cent each, according to research by Macquarie, with the Peugeot family holding 16.5 per cent and GM 4.5 per cent. 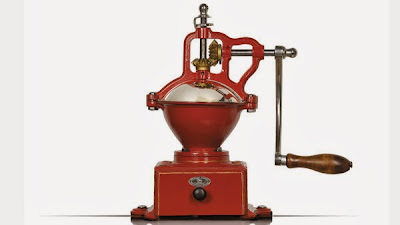 An injection of that size would result in the Peugeot family losing control of the business it founded in 1882. Based in Wuhan, in central China, Dongfeng is one of China’s largest car manufacturers with annual revenues of $63bn. It already operates a manufacturing joint venture with Peugeot alongside three others – Honda, Kia and Nissan – and last week signed a fifth joint venture agreement with Peugeot’s French rival Renault. If completed and approved by Beijing, Dongfeng’s tie-up with Peugeot could catapult it on to the global stage – something that no Chinese state-owned carmaker has yet been able to achieve. Hangzhou-based Geely, which purchased Volvo Cars from Ford in 2010, is privately owned. Peugeot accounts for 60 per cent of France’s car production and employs close to 100,000 people locally. General Motors will shift the bulk of its non-Chinese international operations from Shanghai to Singapore in 2014, marking a coup for the Asian city-state as it lures an increasing number of multinational companies with tax breaks and other incentives. The Detroit-based carmaker said it would locate 120 staff in Singapore to oversee markets in the Association of Southeast Asian Nations (Asean), Africa, India, South Korea and the Middle East, as well as the European operations of Chevrolet – its best-selling brand – and Cadillac, its luxury marque. The shift is the latest success in Singapore’s efforts to encourage multinational companies to establish regional headquarters, as it takes advantage of companies’ desire to tap into the region’s rapidly growing markets. It also marks GM’s return to Singapore after a decade. The company moved its Asia-Pacific headquarters from Singapore – where it had been since 1993 – to Shanghai in 2004. That coincided with the rapid emergence of China’s car market, where GM around that time started selling more units of its Buick brand than in the US. By making the decision to shift its “consolidated international operations” (CIO) to Singapore, GM is in effect carving out a separate unit from its now much larger businesses in China and South Korea. GM said decisions about its CIO markets would now be made “in the interest of growing our business while allowing us to focus even more intently on China”. The company plans to retain 250 staff in Shanghai to oversee China, while 245 staff will remain in Seoul. GM’s light vehicle sales in China have risen by an average annual rate of 27 per cent over the past five years, from 1.1m units in 2008 to almost 3m in 2012, making the country its largest market. Its operations there include four manufacturing joint ventures, an research and development centre and four sales and service operations. “GM has achieved a very deep level of localisation in China,” said Bill Russo, a Beijing-based automotive consultant. The 10-nation Asean bloc, of which Singapore is a member, is home to a population of about 600m and has a combined gross domestic product just behind those of China and Japan. 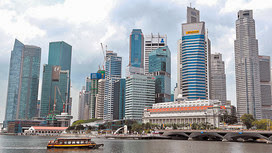 Singapore ranks among one of the most business-friendly cities in the world, offering a corporate tax rate of 17 per cent, political stability, a UK-based legal system and sophisticated financial services. Consumer goods companies, whose revenues are increasingly coming from emerging markets in Asia such as Indonesia and Vietnam, have also been expanding in Singapore. McDonald’s, the US fast food company, recently upgraded its regional hub there as the operational base for Asia, the Middle East and Africa. Procter & Gamble runs its global Pampers nappies business from Singapore, and is poised to open a research and development centre in March that will be the largest commercially run such facility in Singapore. Rival Unilever, maker of Dove soap and Lipton tea, operates a global operations hub out of the city-state, where it bases its group chief operating officer. Similarly, suppliers are also expanding in Singapore. In June, Givaudan broke ground for a new fragrance manufacturing facility and “perfumery school” in Singapore to develop scents and flavours that cater to Asian preferences. However, some foreign companies are having increasing difficulty hiring workers with certain skills after the Singapore government this year tightened up on the influx of foreign workers. STAMFORD, Connecticut – HARMAN International Industries, Incorporated (NYSE:HAR), the premium global audio and infotainment group, today announced that Bill Russo has joined the company as Vice President of Corporate Development for Harman’s North East Asia & China operations, with primary reporting to David Jin, Chairman & President of Harman North East Asia & China. Mr. Russo also reports to Sandra Rowland, Vice President, Corporate Development and Investor Relations for Harman International. He has responsibility for new business development, regional growth initiatives, strategy deployment and related communications. Mr. Russo most recently was President and CEO of Synergistics Limited, an Asia-based business development advisory firm. From 2004 to 2008, he served as Vice President of Chrysler Group’s North East Asia business, where he directed operations for the regional markets. While at Chrysler, he served in roles of increasing responsibility, including oversight of Product and Business Strategy. Earlier in his career, he worked in the global services and technology divisions for IBM Corporation. Mr. Russo has published numerous articles and is a frequently quoted expert in the major financial media on developments occurring in the global automotive industry. He regularly speaks at major automotive industry conferences and events. Mr. Russo holds a Master of Science degree in Manufacturing Systems Engineering from Lehigh University and a Bachelor of Science degree in Chemical Engineering from Columbia University. Mr. Russo will be based at Harman’s North East Asia headquarters in Shanghai, China.